Maps are one of the most important tools we use to research and date buildings. The variety of information conveyed on maps is quite impressive, and can include building footprints and materials, transit lines, dates of construction, and ownership information. More and more maps and views are available online. If you know of a St. Louis map that isn’t listed here, let us know. If you’re researching a building in the City of St. Louis, you’ll want to look at the original plat of the subdivision where your house is located. This is found in City Hall at the Recorder of Deeds office, Room 128. Look for a bound book of computer printouts listing plats by city block. Most blocks will have at least one reference to the original plat of any subdivisions there. You’ll know these because they contain a reference to a plat book – PB, with a number following for the book and a page number. The City has digitized all of the fragile original plats, so ask for assistance to find your plat book on the computer. You can get a large-format printout map for $8. 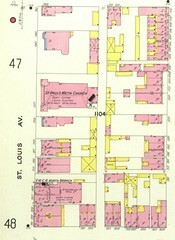 Part of a Sanborn fire insurance map. A wide assortment of auction maps, streetcar and road maps, and fire insurance maps are available at the Missouri History Museum Library and Collections Center (225 S. Skinker Boulevard). These are still indexed in a special section of the card catalog, filed by year. Sanborn Maps are a valuable resource for the researcher. These fire insurance maps plot building footprints and color-code them to show the type of construction. The University of Missouri has digitized an early 19th century set of Sanborns for St. Louis in full color and put them online. If you are a member of the St. Louis County Public Library, that system’s online services include black and white versions of above maps and another run from the mid-20th century. The Missouri Historical Society is also a good source for Sanborns. Sanborn coverage begins in the 1890s, making the 1883 Hopkins Atlas of St. Louis indispensible for researching earlier buildings. The Hopkins atlas can be found in the St. Louis History Room of the Central Library, 1301 Olive Street. The Whipple fire insurance maps are also useful, and can be found at the Missouri History Museum Library and Collections Center or online here in years 1870, 1876, 1889-1892 and 1895-1898. A particularly useful Whipple publication was the Special Risk volumes of 1872, 1876 and 1878. These volumes have detailed floorplan and three-dimensional renderings for industrial facilities, and can be found online here. Other visual resources available online include the very detailed Compton & Dry view of St. Louis in 1875. This and other views can be found as a single, scalable stitch image here or at the Library of Congress’ online Panoramic Map Collection. Less well-known than Compton & Dry’s comprehensive bird’s eye is the 1859 perspective view of the city by Janicke. This view looks west from the river but includes three-dimensional renderings of city buildings in detail. 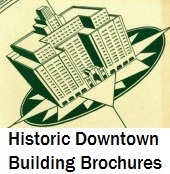 This is an excellent source for envisioning early city buildings around the riverfront. This map is online here. Big Map Blog posted the 1893 Rand McNally street map of St. Louis city. Big Map Blog has posted a 1968 aerial view of the city here. Pitzman’s Atlas of 1868, which shows land ownership in the city and County, and many other wonderful visual resources are located on the History’s Time Portal to Old St. Louis web site here. Waagner’s Map of St. Louis County from 1857 shows early settlement of the County.